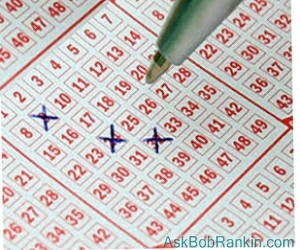 Is winning the lottery just a matter of luck and chance, or do math geeks have an edge? Rolling stones gather no moss, but could reversing that old adage hold the key to improved tire life? Can you name the top three most popular websites? And why have most people never heard of the fourth most popular site on the Web? Get answers in today's Geekly Update -- it's jam-packed with the latest tech news. This issue is guaranteed to make you 146% smarter -- you'll see why. Read, think, and, comment! A combination of curiosity, math skills, and hard work made Jerry Selbee a millionaire. After retiring from his job at the Kellogg's plant in Battle Creek, Jerry spotted a flaw in a Michigan lottery game, and became a serial winner. Here's the fascinating story of how he (and some MIT students) broke the code. “Alexa, Shush!” Pretty soon you’ll be able to turn on Alexa's Brief Mode, and she will substitute brief bird-like “chirps” for the digital assistant’s normal Chatty Cathy responses to commands and questions. I wonder why Amazon decided to offer this option. According to Alexa (the site-ranking site, not Amazon’s gadget) the top four most visited sites on the Internet are Google, YouTube, Facebook, and Reddit. If you’re not sure what a Reddit is, you are far from alone. But Reddit is an Internet powerhouse in terms of eyeballs on it, and it may have a shot at restoring civil discourse without trampling free expression. “The New Yorker” takes a deep dive into the topic. "I'm not dead yet!" Constantin Reliu left his home in Romania, and worked as a cook in Turkey for twenty years. Upon returning to his native land, he learned that his wife had petitioned to have him declared legally dead. Reliu's efforts to overturn his "death" have been rejected by a Romanian court, so for now, he's a dead man walking. Apparently starved for any attention, even the most vitriolic, Microsoft is planning to force all Windows 10 Mail users (yes, both of them) to open email links in the Edge browser, ignoring user-set preferences for other browsers. It turns out that standard tires wear out 30% faster on electric vehicles. The higher torque on EV models is what's causing the dramatically increased tire wear. Goodyear hopes to remedy that by filling tires with living moss. No, really. The world’s first 3D-printed house was built in less than 24 hours for less than $4,000. There is now no excuse for homelessness. New Zealand may be the first nation to certify the airworthiness of flying taxis, and permit a fleet of them to roam over populated areas. Larry Page, a Google founder and CEO, is lightyears ahead of the competition, namely Uber. Vox has hit a journalism home run again, with a terrific interview with Bill Nye, “The Science Guy,” in which he talks about how to Make America Great Again by making science respected again. Oh, and Bill also thinks Netflix can save the world, which you might expect from someone who has a weekly show on the streaming platform. Stephen Hawking died March 14, at age 76. Cambridge University has put together the most fitting tribute to his life imaginable. Maybe robots are good for something after all. A six year-old girl’s cancer grew in such a tricky tangle in her neck that three dozen surgeons were afraid to operate upon it, but not this robot.. Most recent comments on "Geekly Update - 21 March 2018"
Hmmm, 3-D printed houses, with a building permit yet, for $4,000 more or less. Is the home building industry doomed? 3 of my 5 computers run linux. Edge is not particularly useful, unlike Firefox or Chrome. The first thing that came to my mind was that this would make a really nice shed for my back yard for less money. I was looking at assembled examples at Home Depot a couple of weeks ago -- sheds the size of those example houses cost more than $4k and are not as nice. Bob, here is my take on the printed house. First, only the perimeter walls are 3-D printed. Everything else is conventional construction. The foundation and the floor are concrete, columns are steel pipe and the roof is wood frame. The windows are glass and the door is wood. Second, the cost is described as the "cost of printing", meaning the walls, not the entire house. Third, the current cost is $10,000. The $4,000 number is a "hope to achieve in the future" cost. Fourth, the report does not say what that cost includes. I am guessing consumed materials only. So the $10,000 (or $4,000) cost buys you 4 walls and that's it. No foundation, no floor, no columns, no roof, no windows, no door. Consider this analogy. Suppose we could 3-D print a car tire for $20.00. Would that mean I could buy a new car for $80? The more comments & articles I read about Win-10 *forcing* users to use MC stuff, the happier I am that I am using Win-7. Linux is looking better every day. I expect that's my future when my present system "dies." MS always seemed to "dictate" to its users--back in the 1980's and later. Thanks for this Geekly Update. Not the world's first 3D printed house, unless you subscribe to the world started and ending in the USA. @Reg; And put lots of slocky contractors out of work. The lady of the house has hired lots of contractors here. And when we look at their work and repair or regret what they've done, we appreciate the work her brother has done. Who happens to be a warehouse shipper and truck driver. He does superior work compared to the majority of "contractors". And works for peanuts. With no arrogance. He's also not contractor insured. This also applies to many car dealers or repair shops. Her brother and I do most of our own PMs and repairs. Leaving out the question of, "was the repair done correctly?" You wrote "but could reversing that old adage." Surely you are aware the phrase "old adage" is redundant. The word "Adage" means "an old saying" therefore "old adage" is saying an old, old saying.